What are the most popular online bachelor's degrees offered in Maine? Maine's membership in the New England Board of Higher Education (NEBHE) provides the state with robust research opportunities and ample resources to support online and distance students seeking affordable higher education opportunities. The NEBHE "Tuition Break" program passes on significant cost savings to traditional and online students, allowing out-of-state students to qualify for lower in-state tuition at many colleges and universities within the six member states. Higher education institutions in Maine understand that interest in online learning is growing rapidly. In an informal survey of small New England colleges that was published by NECBE, about two-thirds of college presidents agree that they must pursue significantly different models of education (like online learning) to remain competitive in the future. One way Maine confirms its commitment to improving online higher education opportunities is through the Learn.Maine.Edu program, a convenient hub of online and hybrid programs offered on the University of Maine system. The system utilizes interactive television (iTV) and video conferencing in the completion of courses. Online colleges in Maine provide students with more convenient and flexible program options than traditional courses may. Distance learners can take advantage of distance education that can allow students to work at their preferred pace, making it easier to balance work and family responsibilities. Students seeking a Roman Catholic liberal arts education rich in rigor can attend Saint Joseph’s College (SJC) at its Standish campus or online. The institution offers academic programs in the liberal arts and sciences, business, education, and nursing, emphasizing hands-on learning for the real world. About 2,500 students around the United States and the world engage in online learning at SJC, which has been delivering distance education since 1976. One of the best online colleges in Maine, SJC has an extensive catalog of online bachelor’s degree offerings in fields ranging from education and information technology to human services and theology. The school offers several BS degrees in health education; specializations include health administration, radiologic science administration, and business administration, and the senior living leadership major. The BS in interdisciplinary studies has several minors, including accounting, health administration, and marketing. Online learners have personal advisors, online tutoring, IT assistance, and other services. The University of Maine at Fort Kent offers students the perfect blend of a scholastic atmosphere with a rural heritage and academic rigor. Among the school’s highlights are faculty who provide students with one-on-one support, a high percentage of international students, professionally-focused educational programs, and affordability. As one of the online colleges in Maine, the school uses high technology to reach distance learners around the nation and globe who take courses, hybrid degree programs, or 100% online degree programs. Bachelor’s degree programs are available online delivered via Blackboard in areas such as cyber security, allied health, information security, and accounting. Two programs of note are the self-designed Bachelor of Arts and Science (BAS), in which students develop an individualized program of study based on their professional interests; and the BAS for undecided students not intending to pursue "identifiable vocational, professional, and/or graduate interests." Established in 1965, the University of Maine at Augusta (UMA) is one of seven universities within the University of Maine System. In addition to being one of the largest universities in the state, UMA is also one of the top online schools in Maine. The university offers 12 online degrees at the undergraduate level alone, many of which have multiple concentrations and/or majors to choose from. Online courses are typically delivered asynchronously, though some classes may require real-time interactions. Each of the UMA online degrees operates along the same schedule as on-campus programs. While most of the online degree programs are independent from the campus classes, some classes host both online and on-campus students simultaneously, using video conferencing to connect everyone. All students admitted into an online program gain access to academic and career advising, the online library, and the learning success center that provides workshops and tutoring. Transferring applicants will have potential transfer credits assessed individually, but UMA typically accepts credits that were completed with a 2.0 GPA. A strong educational tradition and world-class faculty make the University of Maine (UMaine) a popular destination for many students seeking a vibrant and dynamic university. UMaine offers 90 undergraduate academic programs, 70 master’s, and 35 doctoral programs. One of new England’s premier institutions, UMaine in known for research that is internationally recognized and state-of-the-art facilities. The school also has a strong presence in distance learning being one of Maine’s online colleges. In addition to several master’s programs and certificates that can be earned online, UMaine offers a BA in political science and bachelor of university studies (BUS). The BUS has four tracks: self-designed, labor studies, leadership studies, and Maine studies. The institution also offers courses year round via the Summer University and the fully online Winter Session. UMaine’s "Think 30" program encourages students to complete 30 credits per year to graduate on time and reduce college debt. Husson University (HU) is a private university and home to about 3,500 undergraduate and graduate students engaged in experiential learning with a curriculum that embraces global engagement. Located in Bangor, HU’s three colleges and two schools administer educational programs in a wide range of disciplines. HU, one of Maine’s online colleges, offers three bachelor’s programs that can be earned from a distance: a BS in business administration with a general emphasis and two areas of specialization--marketing and management; a BS in software development; and an RN-to-BSN. HU notes that its programs offer flexibility, can be completed in an accelerated format, and are affordable; almost 90% of students receive some form of financial aid such as federal, state, or scholarships. If you want to qualify for a range of high-paying job opportunities, earning a college degree is key. When deciding where and what you want to study, you may end up weighing both in-state and out-of-state schools. If you are from Maine, there are many advantages to attending college in your home state. Sticking close to home can qualify you for in-state tuition and help you build a network of regional professional contacts. You may also benefit from your school's name recognition on the local job market, and you'll be relatively close by if you need to occasionally visit campus. When researching programs, be sure to consider our list of the most affordable online colleges in Maine. All of the schools in this list are accredited, and our rankings highlight the colleges that offer the best blend of affordable tuition and return on investment. The University of Maine at Fort Kent is a public, liberal arts university near Quebec that is unique among colleges in Maine in that many of its students are bilingual in French. UMFK offers 15 undergraduate degrees and two certificate programs online. UMFK delivers courses both synchronously and asynchronously through Blackboard. Though out-of-state residents pay higher tuition, UMFK's tuition rates are low enough that the school is still widely considered one of the most affordable online colleges in Maine. First-year applicants at UMFK will be competitive for admission with a 2.0 high school GPA. Transfer applicants must have completed at least 13 credits of college credit with a minimum GPA of 2.0. Unlike many online colleges in Maine, Husson University is not a member of the University of Maine system. Since the college originally opened as a business school, most of Husson's online programs are business-related, though the school does offer nursing and integrated technology degrees as well. Since the school strives for flexibility, most programs deliver coursework asynchronously. Undergraduate applicants must submit high school or GED transcripts along with standardized scores. Transfer applicants should submit all college transcripts and can apply up to 90 credits toward a bachelor's degree or six credits toward a master's degree. A wide range of financial aid options ensure that Husson is one of the most affordable online colleges in Maine. In addition to its two online undergraduate degrees, the University of Maine offers several graduate programs and certificates. Students can earn bachelor's degrees in political science or university studies, or they can pursue master's degrees in subjects such as education, business administration, or biomedical science. Undergraduate minors are also available in labor studies, political science, and child development. UMaine's online programs aim for flexibility, delivering most coursework asynchronously through Blackboard. Though out-of-state students pay higher tuition, a special tuition rate for online nonresidents makes the school one of the more affordable online colleges in Maine. A private, Catholic-affiliated liberal arts school located on Sebago Lake, St. Joseph's College of Maine offers a wide variety of bachelor's and master's programs. The school's most popular fields are business, health administration, education, and theology. First-year applicants must submit high school or GED transcripts, but no standardized test scores are required. SJC is a transfer-friendly school, offering a generous number of transfer scholarships. Most transfer credits are accepted at SJC, provided that students earned at least a "C" grade in their courses. With its flat, per-credit tuition rate that allows out-of-state students to pay the same amount as in-state students, SJC earns its place among the most affordable online colleges in Maine. The University of Maine at Presque Isle offers online programs in English, history, psychology, and education. The school's elementary teacher preparation program is its most popular online offering. UMPI delivers coursework asynchronously through Blackboard, and students can access their course materials 24/7. Though online students do not qualify for in-state tuition, the school's out-of-state tuition rates are relatively low. Because of this, UMPI is still one of the more affordable online colleges in Maine. Freshmen applicants must submit one letter of recommendation and high school or GED transcripts, while transfer applicants must submit transcripts from all previous coursework. In 2012, 10,503 students were enrolled in fully online distance learning programs in Maine. Though the state has struggled to maintain its postsecondary graduation rates over the past decade, total enrollment has increased by about 12% at public institutions. Maine understands the value in online and distance learning, and has invested in a comprehensive infrastructure at the K-12 level to provide access to disadvantaged students, create unique educational opportunities and prepare students to take advantage of this style of learning at the college level. The MCCS Rural Initiative, part of the Maine Community College System, made investments in 2008 that continue to support expanded distance learning opportunities for students in rural parts of the state. Additionally, the University of Maine Systems supports the Learn.Maine.Edu program, which offers online and distance degree and certificate programs through its network of seven four-year schools. University College, which is also part of the University of Maine System, has eight off-campus outreach centers and offers over 400 courses online in various areas of professional development and continuing education. As online programs in higher education continue to gain popularity in Maine, the amount of specialized programs offered will increase considerably. 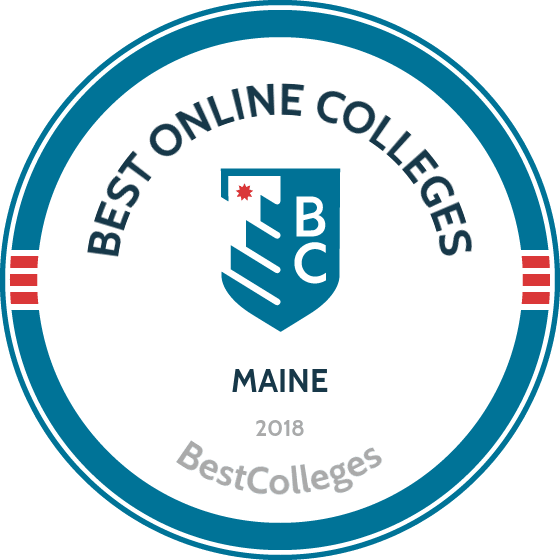 Browse our list of the best online colleges in Maine for more insight into distance learning programs in this state. Recent NCES reports indicate that 10.1% (6,568) of undergraduate students enrolled in Maine's Title IV institutions were in exclusively online programs. Employment growth in this profession is moderate in Maine. According to the Maine Center for Workforce Research and Information, long term projections showed no marked increase or decrease in the total number of jobs between 2014 and 2024. Wages decreased by 9% from 2011-2016. In 2016, what were the top careers in Maine for people who had a degree in liberal arts and sciences/liberal studies? Data source: Maine Center for Workforce Research and Information, Bureau of Labor Statistics. Data may not be available for every year. Employment growth in this profession is moderate in Maine. According to the Maine Center for Workforce Research and Information, long term projections show an increase of 4% in the total number of jobs between 2014 and 2024. Wages increased by 7% from 2011-2016. In 2016, what were the top careers in Maine for people who had a degree in business administration and management? Employment growth in this profession is moderate in Maine. According to the Maine Center for Workforce Research and Information, long term projections show an increase of 12% in the total number of jobs between 2014 and 2024. Wages increased by 2% from 2011-2016. In 2016, what were the top careers in Maine for people who had a degree in registered nursing? Employment growth in this profession is strong in Maine. According to the Maine Center for Workforce Research and Information, long term projections show an increase of 128% in the total number of jobs between 2014 and 2024. Wages increased by 15% from 2011-2016. In 2016, what were the top careers in Maine for people who had a degree in criminal justice/law enforcement administration? Employment growth in this profession is moderate in Maine. According to the Maine Center for Workforce Research and Information, long term projections show an increase of 5% in the total number of jobs between 2014 and 2024. Wages increased by 14% from 2011-2016. In 2016, what were the top careers in Maine for people who had a degree in computer and information systems security/information assurance?